Today’s interview subject is a guy who is unique for many different reasons. First of all, he is probably the first full fledged Production Designer we have had featured on the site, and checking that box is pretty damn cool. Also, he is one of the best in the game, who has worked on just about everything you love most likely. Secondly, he is the filmmaker behind one of the most terrifying films I have ever seen. That film is the cult classic project Alice Sweet Alice, also famous for being the breakout role for one Brooke Shields. One thing not so unique to this site, but absolutely amazing either way, is his involvement with a project we adore and have spoken with several folks in the past about, and that would be Friday the 13th: The Series. I’m not sure how many writers and actors from this short but sweet series, but I know it is certainly not enough! So Ladies and Gentlemen, please enjoy some amazing words from the brilliant artist we should all know and love, the wonderful Alfred Sole! Have you always had the passion to create, or did you just find yourself in this line of work one day? When I was younger, I thought I wanted to be a painter. I wanted to be Salvatore Dali. When did you first discover that you had a passion for the world of film and television? 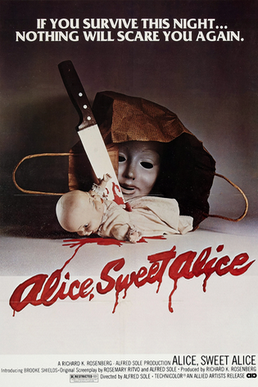 The 1976 thriller Alice Sweet Alice, which you wrote and directed, was my earliest experience with being scared out of my mind. Going back to it as an adult, I find it to be just brilliantly made, and a truly strange tale. So where did the inspiration for such a frightening tale come from? What made you want to tell this strange story? It started from the Catholic mass- Take my Body. Take my Blood. Of course, I was raised Catholic. I kept reading about low budget features, and how directors got started. Then I went to see the movie Don’t Look Now, which I thought was brilliant. I started thinking about what it would be like, for a storyline, to kill someone- a little angel during her first Holy Communion, while everyone was taking the host, which is supposed to be the blood and body of Christ. Alice Sweet Alice has built a cult following amongst avid horror fans. I know why I love it so much, but what do you believe it is about the film that has kept audiences interested in the film for over 40 years? I just think it’s a good story. It was made with a lot of love and passion. Another project that we have discussed at lengths here at TWS is Friday the 13th: The Series, having talked with several writers and actors from the series. I understand you worked on this highly underrated program as well! How was your experience working on a project like this? I worked with the Producer at the time, who was very supportive of my writing. They were looking to do Friday the 13th. She needed to figure out a way to do it as a TV series. Eventually after many conversations, I came up with the idea of the pawn shop. 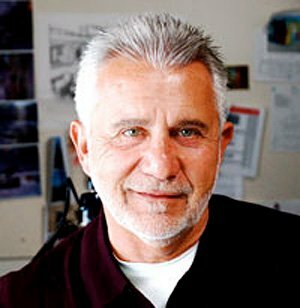 Beyond writing and directing, you are also a very accomplished production designer, having worked on very popular television series like Veronica Mars and Castle. For those of us who may be a bit more ignorant to what actually goes into make a film, can you tell us the importance of production design? And what are the specific duties that pertain to being a production designer? I remember reading about David Lean and Alfred Hitchcock, how they started out, as Art Directors. Originally people were called Art Directors which evolved into Production Designers, and I was studying architecture and design. I remember when I was doing Communion I had found my own locations and almost all of the costumes. It’s very hard for me to let go and give that kind of work to someone. What a Production Designer does is, whenever you see an actor, behind him is the sets. Whether digital or built, I really have a passion for that. One film that you worked on happens to be a classic that I watched as a teen repeatedly. It was Rich Wilke’s Glory Daze. So, I have to ask, what was set life like on that film? You also had a brief cameo as well. So how was that? Was it as fun to be a part of as it was to watch almost weekly as I did? Working on Glory Daze was LOTS of fun! There was very little money, but Rich was such a smart director, that I enjoyed the collaboration. Don’t ask me why I wound up in the film. I usually get very nervous when I have to speak or appear anywhere, but I do think, if I recall correctly, the actor who was supposed to do it, didn’t show up. They asked me to do it. I enjoyed watching Glory Daze, except for my scene. I was embarrassed. One of the things I remember about that film is Ben Affleck, who was in the film, used to practice his lines. I would hear him saying the same thing over and over, in different ways. He was so young and serious. Matt Damon would come by and they were friends and would hang out. I had a vibe from those two guys that they were going to go on to bigger and better things. There was just something about it. I couldn’t put my finger on it. Right now, I’m Production Designing MacGyver for CBS, and it’s been hard work but great fun. We get to go 2 or 3 different countries on every episode and we build a lot- from insides of airplanes to insides of ships to Afghanistan. I enjoy the challenge. I hope someday that they will do a remake of Alice, Sweet Alice. I’ve been approached before to do a “2”, but I turned it down. I want to do a remake of the movie with a rewrite of the first draft. This makes me smile: I can’t believe the movie has its own life. People are discovering it.